While print is far from dead, most notably through the recent renaissance of photobooks in the past five to ten years, it’s a safe and obvious assumption that most of our interaction with images today occurs on screens. This pixel-heavy experience is at the heart of artist Paul Stephenson’s latest exhibition Forced Collaboration which includes three recent bodies of work: Watermark Paintings, Internet Paintings, and Reflection Paintings opening August 5th at London’s StolenSpace Gallery. For each of these series, Stephenson transforms nineteenth century paintings, purchased at various auction houses, into his own by graffiti’ing them with facial recognition outlines, watermarks from tech companies like Google and Shutterstock, and other symbols of digital interference. One of Forced Collaboration's early works was a 1853 oil painting by A.E. Adamson that he acquired a few years ago in an art auction. 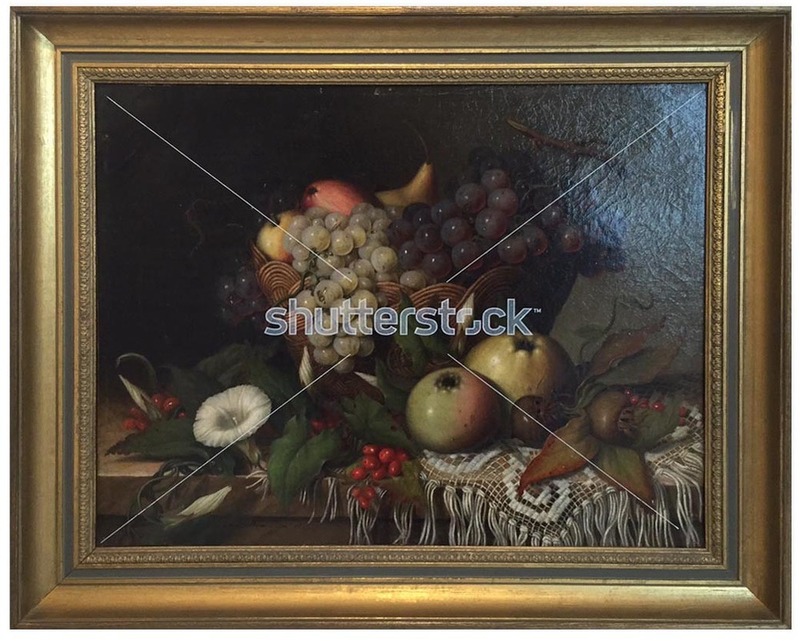 Stephenson meticulously painted an old version of a Shutterstock watermark onto its surface, transforming it into a tangible copy of an image that could be searchable online: art history experienced through a multi-meta'd lens of technology and eCommerce. As his work evolves, he has expanded his process beyond logos and other digital markings to include photorealistic reflections that mimic the surface of digital tablets, smartphones and computer screens. Stephenson was first inspired by what he initially saw as a digital “barrier” to intimately engaging with imagery. As many photography editors and curators often note, these kinds of watermarks - generally used to protect an artist's copyright - are sometimes an obstacle to engaging with an their work. While Stephenson may have started with a critical edge, he's begun to see these elements as a point of engagement, not a source of obstruction. “Whether you think this interaction is positive or negative,” he says, “the watermark changes the way you experience the images.” In Reflection Paintings, the reflections he’s painted on their surfaces nod to another form of interference when reflections obstruct arts visibility on screen. For Stephenson, these digital markings not only alter the paintings’ original meaning, they have the potential to make them iconic. His third group of paintings, Internet Paintings are recreations of famous art-historical works as rendered, and distorted through platforms like Google Arts & Culture's virtual tours. Forced Collaboration adds a new angle to traditions of appropriation in art history, stretching from early twentieth century Dadaists like Marcel Duchamp, to 1970’s and 1980’s Pictures Generation artists like Richard Prince, Robert Heineken and Sherrie Levine. Like Duchamp’s Fountain, or Prince’s Marlboro Man, Stephenson repositions existing images to change how we understand them. While these artists worked at odds with their source material (think Robert Heinicken's 1971 Periodical #5, which overlaid horrific Viet Cong images onto the pages of lifestyle magazines), Stephenson sees his practice as an ongoing conversation with the paintings' original authors. His commentary focuses on how we experience these historical works within the shadow of current technology, as opposed to a critique of the original artist. Bio: Paul Stephenson lives and works in London. After studying in New York. His work is concerned with erasure, creative destruction, censorship, and how images are transformed when viewed on screen. His current exhibition Forced Collaboration is on view at StolenSpace Gallery in London from Friday, August 5th to Sunday August 28th, 2016. Read more about his work HERE.